As we get ready for the “Green Season,” we’re starting to think of activities you can plan while you’re here at Turpin Meadow Ranch, and we recognize our guests with families have adventuring on their minds. For groups wanting to enjoy all the beauty of the area with less of the challenge, we’ve put together this collection of hikes that are great for littles and those who require less strenuous ventures. Yellowstone has recently opened this new trail, which includes an overlook system for Grand Prismatic Spring. Built with assistance from the Montana Conservation Corps and Yellowstone’s Youth Conservation Corps, the new trail gradually climbs 105 feet over 0.6 miles from the Fairy Falls Trailhead to an overlook with views of the Midway Geyser Basin. 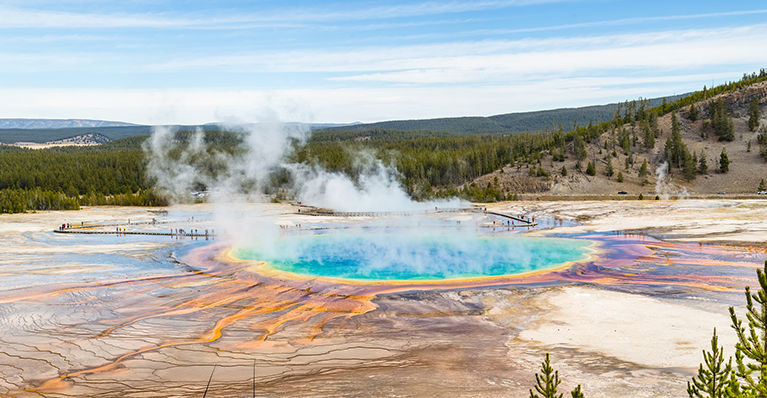 To access: Take Grand Loop Road north of Old Faithful and park at the Grand Prismatic Spring Parking Lot. Take the southern trail across the Firehole River for a loop that connects Grant Prismatic Spring; the north section of the loop also passes by Opal Pool and Turquoise Pool. Notes: Trail open from Memorial Day through late fall. Carved by a glacier and covering 1,191 acres, Jenny Lake is the second largest lake in the Grand Tetons. Named for a Shoshone Indian named Jenny who assisted with camp logistics during the Hayden Geological Survey of 1872, it is also one of the deepest lakes of the area. 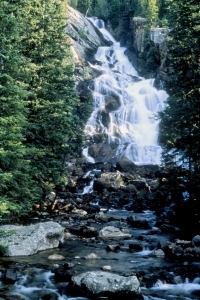 Hidden Falls itself is about 100 feet in height and cascades over an appealingly arranged natural series of steps. For more than 75 years, the trails leading to Hidden Falls have been some of the most popular through the area, but the park launched an improvement project in 2014 that has included extensive rehabilitation of trails. The boat ride cuts roughly 2.4 miles of walking each way, but there is a fee for the shuttle service. To access: Turn west off Teton Park Road at the South Jenny Lake Junction, located 7.7 miles north of Moose Junction. From the junction, drive another half mile to the boat dock parking area. After taking the 12-minute shuttle boat across Jenny Lake, take the Cascade Canyon Trailhead, located at the West Shore Boat Dock. At just over a half mile from the boat dock, cross the horse trail and look for a short side trail on the left that leads to the viewing area of the impressive Hidden Falls waterfall. Notes: Due to berry bushes along the path, this is an active bear area and hikers should be on the lookout and carry bear repellent. You can bypass the boat and hike around the lake, this is a 5-mile round trip hike with a 711 foot elevation gain. This is more of a moderate level hike. 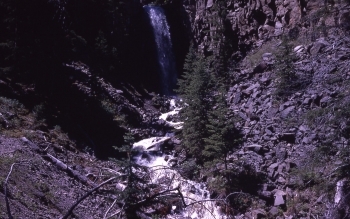 Lost Creek Falls is a relatively unknown, and pretty, 40-foot waterfall in Yellowstone that is accessed by an easy half mile round trip hike on a dirt trail. The trail starts behind Roosevelt Lodge and runs through shade and thick forest, following Lost Creek the entire way. Hikers generally report it is less traversed than most paths in Yellowstone, making it a good place if you’re looking for a little solitude or a cool escape on a hot day. It also includes a little bit of scrambling over logs and rocks, which could be a fun challenge for your junior ninja warriors. To access: Roosevelt Lodge is located right across from the northeast entrance to the park on Grand Loop Road between Petrified Tree and Tower General store. Park at the lodge and hike behind to find the trailhead. Notes: The area is known for both black and grizzly bears, so be on guard and carry bear repellent. We hope you enjoy your experience while at Turpin Meadow Ranch. As always, ask our staff for any suggestions or advice, and let us know (in person, on social media or via email) how your trip worked out.